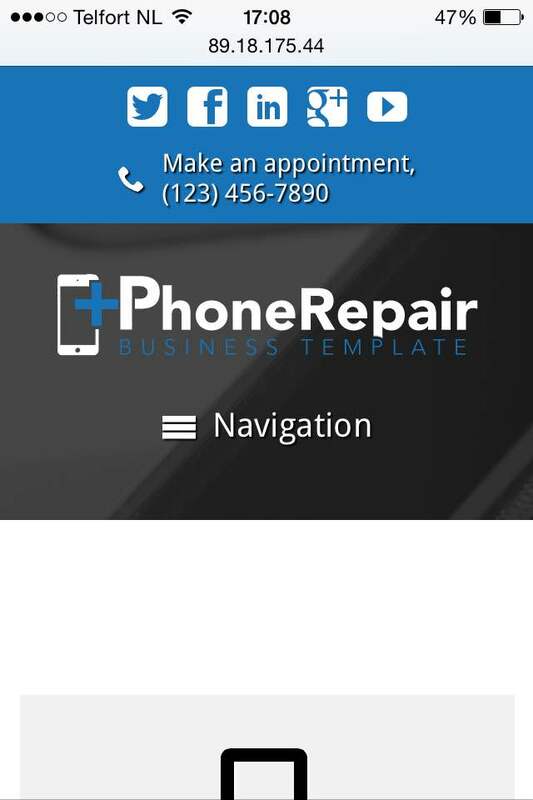 With a sleek, professional website built with the iPhone Repair WordPress theme, you can get the word out about your services and expand your reach. Just fill in your own text and images to get your complete website online today! 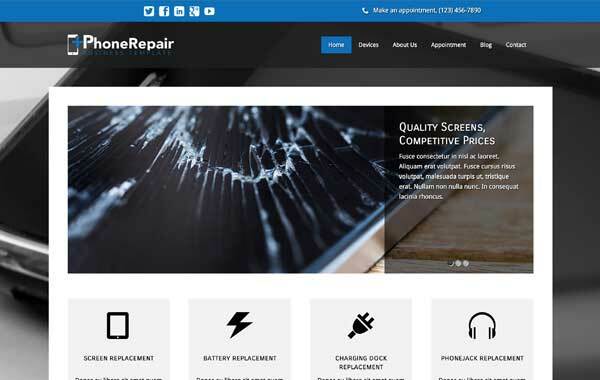 Convince clients of your tech savviness and expertise in mobile phone repair services with a great-looking website that presents them with all the info they're looking for. 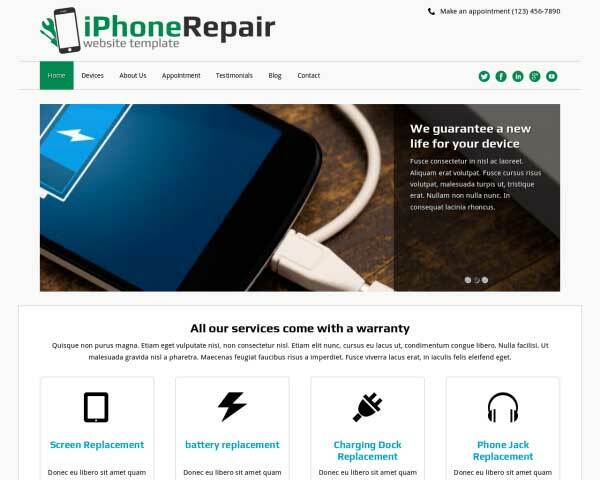 The iPhone Repair WordPress theme is designed to help you easily create a professional online presence just by replacing the text and photos on this sleek pre-built website template. We've included pages for various models of iPhones and other Apple products, all of which can be easily customized to suit your needs by using our powerful front-end editing tool and drag and drop widgets. Change the color scheme and fonts or customize the fields on the online appointment booking form with just a few clicks! Take advantage of the premium business features like integrated social media and a helpful SEO manager to raise awareness of your services and boost your search engine rankings. 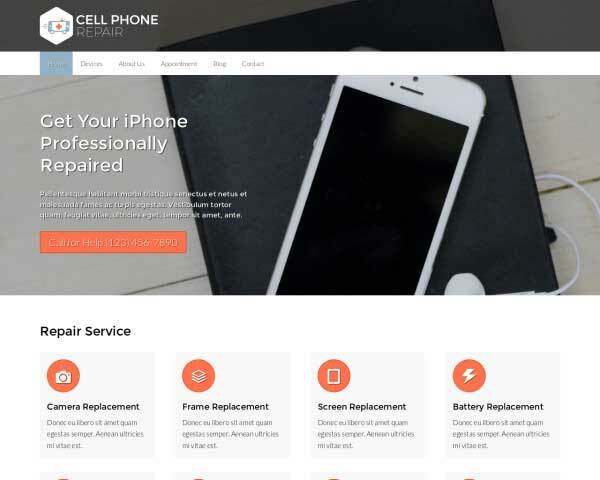 With the iPhone Repair WordPress theme, you can build and maintain a great-looking website that will attract new clients and grow your business. 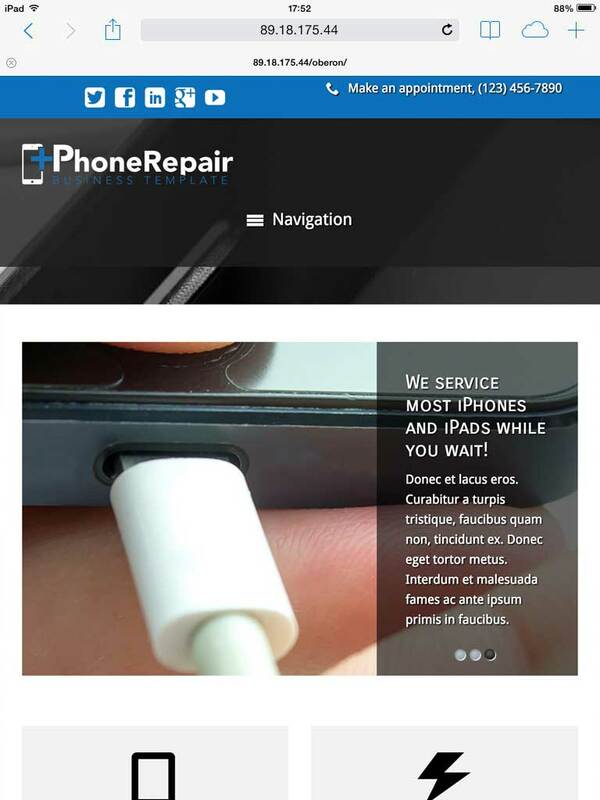 The IPhone Repair WordPress Theme is an excellent theme to create appealing and eye-catching content. Your individual blog items are nicely highlighted on your homepage and a dedicated "blog" page. 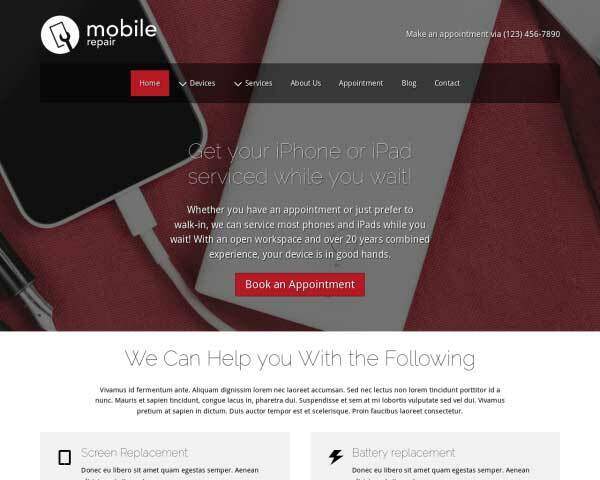 The IPhone Repair WordPress Theme comes with a built-in booking form, allowing you to take appointments online even outside of business hours. 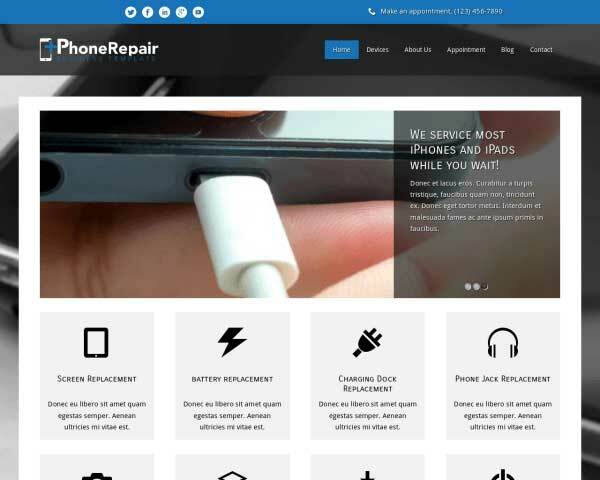 The IPhone Repair WordPress Theme was designed specifically for repair technicians. So chances are that anything your electronics website might need is already there - at your fingertips! Showcase your favorite photos on your homepage with the IPhone Repair WordPress Theme's classic image slider. The contact page on the IPhone Repair WordPress Theme encourages visitors to get in touch. List your contact details together with a Google map, route planner and customizable contact form. The IPhone Repair WordPress Theme contains already configured pricing tables, which can be easily edited to hold your own pricing figures. 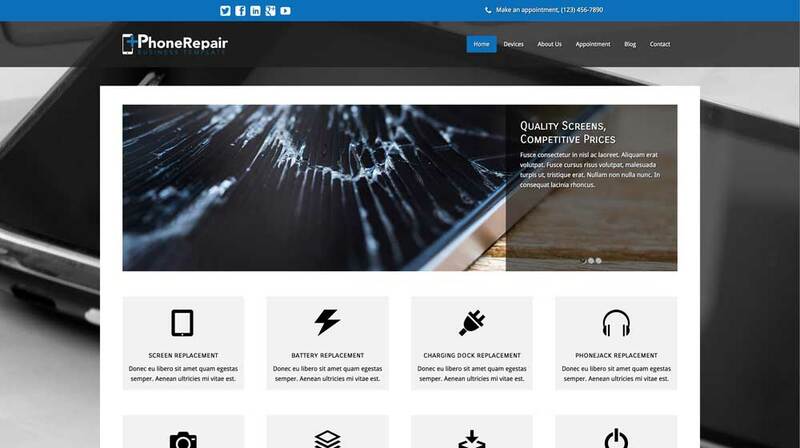 With the IPhone Repair WordPress Theme you have a quality tool to create elegant and appealing service detail pages with above-average layout and styling. The IPhone Repair WordPress Theme comes packaged with sharing and following icons for popular social media platforms, and widgets that display a Facebook or Twitter feed. When your business specializes in repairing mobile devices, it's especially important that the mobile version of your website makes a great impression on prospective clients. This responsive iPhone Repair WordPress theme is mobile-optimized right out of the box, so you won't waste a moment on complicated coding or searching for plugins to get your content to display beautifully on small screens. This website template is designed to automatically adjust the layout of your content to fit neatly on any screen size. Mobile visitors will enjoy the convenience of being able to simply tap on your phone number to dial or tap your email to open a new draft.